Major changes to the PDFParser including upgrade to PDFBox 2.0.1 (TIKA-1285, TIKA-1959). This include the classic sequential parser is no longer available, Tiff files are no longer extracted by default, Some truncated/corrupted files that had some content extracted with 1.8.x may have no content extracted in 2.0.x. The MIT-NLP Information Extraction (MITIE) Named Entity Recognition (NER) system is now supported in Tika (TIKA-1913, Github-108). 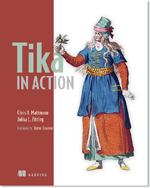 Tika now supports the use of the Yandex translation service (TIKA-1943, Github-106). Tika now uses NER to extract scientific measurements from text using either GROBID Quantities which uses conditional random fields and NLTK which uses regular expressesions (TIKA-1917, Github-104). Fixed JournalParser to handle null responses from GROBID and to log a message (TIKA-1925). Refactored Language Detector into tika-landetect module, added default N-Gram implementation}}, Optimaize LangDetector and MIT Text.jl implementation (TIKA-1872, TIKA-1696, TIKA-1723). Extract metadata from MP4 videos whether or not the PooledTimeSeries parser is available via Aditya Dhulipala (TIKA-1844). Fix NPE when trying to get embedded image identifier in WordParser (TIKA-1956). Improvements to MIME database for detection of Scientific and other formats present in the TREC-DD-Polar dataset (TIKA-1881, Github-85, TIKA-1883, TIKA-1884, TIKA-1886, TIKA-1882). LinkContentHandler now extracts links from script tags via Joseph Naegele (TIKA-1937). Handle per page IOExceptions more robustly in PDFParser (TIKA-1948). Upgrade commons-compress to 1.11 (TIKA-1949). Add detection for embedded MSChart.Graph files (TIKA-1033). Fix NPE in Sqlite parser from Nick C (TIKA-1927). Fix NPE in Open Document parser from Nick C (TIKA-1916). Upgrade mp4parser's isoparser to 1.1.7 (TIKA-1924 and TIKA-1931). Upgrade BouncyCastle to 1.54 (TIKA-1923). Upgrade Jackcess to 2.1.3 (TIKA-1922). Upgrade Drew Noakes' metadata-extractor to 2.8.1 (TIKA-1921). Upgrade Gson in tika-serialization to 2.6.2 (TIKA-1920). Upgrade commons-cli in tika-batch to 1.3.1 (TIKA-1919). Add XMPMM support to PDFParser and JpegParser via Jempbox (TIKA-1894). Move serialization of TikaConfig to tika-core and enable dumping of the config file via tika-app (TIKA-1657). Tika now incorporates the Natural Language Toolkit (NLTK) from the Python community as an option for Named Entity Recognition (TIKA-1876). Add support for XFA extraction via Pascal Essiembre (TIKA-1857). Upgrade to sqlite-jdbc 3.8.11.2 (TIKA-1861). NOTE: this dependency is still scopeprovided/scope. You need to include this dependency in order to parse sqlite files. Upgrade to POI 3.15-beta1 (TIKA-1895). Upgrade to Jackson 2.7.1 (TIKA-1869). Upgrade to Apache SIS 0.6 (TIKA-1878). RichTextContentHandler moved from the Server package to Core (TIKA-1870). Added ZeroSizeFileDetector to support application/x-zerovalue via Adesh Gupta (TIKA-1885). Addition of types information to Grobid quantities parser via Can Menekse (TIKA-1965). See https://s.apache.org/BaRc for more details on these contributions.